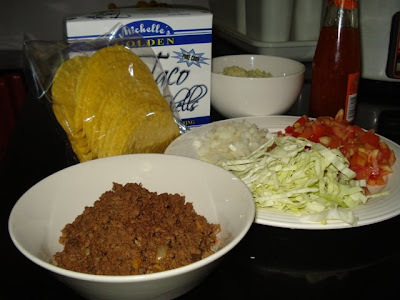 He made tacos for me, a family favorite, from what I reckon from his stories. (This cousin can finish this much and that other cousin can finish more.) An aunt can even make taco shells from fried lumpia wrapper. 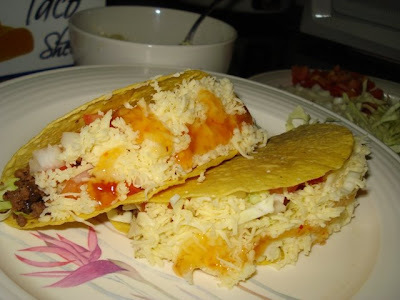 Now I haven't seen anyone do that but from what Archie says, taco shells are hard to come by in the province so they make improvised shells from lumpia wrappers. The only thing you need to cook for these tacos is the ground beef. For the other ingredients, except for the cheese and sauces, all you'll need is a chopping board and a good knife, and you're all set. the skins. Saute in a pan. the cabbage into short strips. 1. In the bottom of each taco shell, put a generous helping of cabbage. 2. Add the cooked ground beef and the grated cheese. Layer with sweet chili sauce and garlic sauce. 3. Add the tomatoes, white onions, and more cheese. Of course, it's up to you to add more chese or put in less onions, according to your taste. Archie says you can also use salsa, or add some chopped mushrooms on the ground beef if you like. Or, instead of ground beef, you can cook shredded chicken. Enjoy!